For the past few weeks, Italy’s political situation has rattled investment markets. Investors fear that the nation’s political direction may lead to credit problems in Italy, and/or lead the country to exit the EU. We avoid reacting to “as it happens” news stories, but we need to look at the facts behind any emerging economic scenario and determine the scale and scope of the risk. As background, Italian elections in March resulted in a fractured parliament; the two leading parties are both populist, and both have espoused skepticism about the EU and the common currency in the past. These parties agreed in mid-May to join forces and form a coalition government; the transition period that followed was extremely contentious but the new government was sworn in on June 1. Italy’s economy—the world’s ninth largest—is not very healthy. Its debt/GDP ratio is 130% (second only to Japan among major economies), and its GDP has grown by less than 0.5% over the past 20 years). Its population is shrinking, presenting a tangible obstacle to future growth. Italy’s creditors are already nervous about these conditions; the recent political issues exacerbated their worries. This is a Euroskeptic coalition, and many investors fear an Italian exit from the EU and/or broad EU destabilization. Few expect a direct referendum on exiting the EU, but the new government’s platform calls for a combination of tax cuts and welfare spending that will almost certainly result in conflict and tension with Brussels. So far, markets have reacted substantially to the first concern, but in very limited fashion to the second. During May, two-year Italian bond yields leapt from -0.3% to a peak of 2.8% before settling back closer to 2%—a very large move in a short period of time. 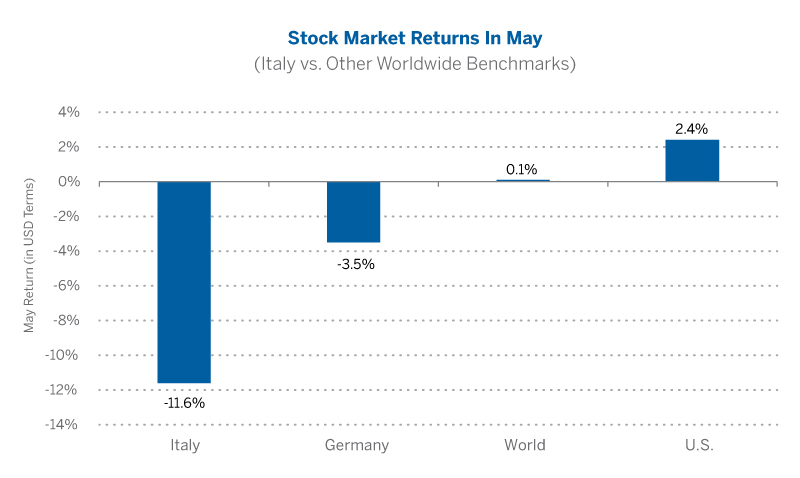 Italian stocks fell more than 9% in May (see chart), with Italian bank shares tumbling more steeply. However, losses have been mild elsewhere; the German stock market was down but to a much lesser extent in May, and the U.S. stock market advanced. Bond yields in other higher-risk EU countries like Spain and Portugal moved up, but only slightly. Source: Bloomberg. As of May 31, 2018. Italy, Germany, World and U.S. market returns are represented by the MSCI Italy Index, MSCI Germany Index, MSCI ACWI and MSCI U.S. Index respectively (see below for index definitions). All this suggests that investors are currently sanguine about contagion risk. Partly because of the 2011 Eurozone crisis, the EU has far more robust mechanisms to ameliorate a debt crisis now. Further, exports to Italy are not a large part of other European economies—for Germany, Italy represents just 2.5% of total exports, and the figure is lower for other major EU nations. Finally, we believe that concerns about Italy should be viewed alongside the healthy fundamentals and attractive valuations that support a more positive view on European stocks. Before this scenario unfolded, a pessimistic view of Italy alongside a positive outlook on the rest of Europe likely made sense. At the moment, we believe that it still makes sense if one holds to the view that Italy’s actions will have muted spillover effect on other economies. Investors should remain on guard, however, for signs to the contrary. The MSCI Italy Index is designed to measure the performance of the large and mid cap segments of the Italian market. With 24 constituents, the index covers about 85% of the equity universe in Italy. The MSCI Germany Index is designed to measure the performance of the large and mid cap segments of the German market. With 65 constituents, the index covers about 85% of the equity universe in Germany. The MSCI ACWI Index is a market capitalization weighted index designed to provide a broad measure of equity-market performance throughout the world. The MSCI ACWI is maintained by Morgan Stanley Capital International (MSCI), and is comprised of stocks from both developed and emerging markets. The MSCI U.S. Index is a market capitalization weighted index designed to measure the performance of equity securities in the top 85% by market capitalization of equity securities listed on stock exchanges in the United States.